Multicolored Asian Lady Beetles are sometimes bright red. “Ladybug, ladybug, fly away home. Your house is on fire, your children all gone.” This ancient nursery rhyme, made famous with slight variation by Peter, Paul, and Mary, apparently had its roots in medieval times when hops were set on fire in the autumn to clear the fields after the harvest. The burning of crops also had the benefit of reducing the numbers of pests finding winter-refuge in the rubble. Unfortunately, the collateral damage was the death of ladybug (a.k.a. lady beetle and ladybird) larvae and pupae that remained behind as the adult beetles escaped the flames. The rhyme certainly presents an interesting allegory of one of our favorite beneficial insects – lady beetles. On a bright, sunny afternoon last week, my daughter’s house was pelted with lady beetles suffering from the delusion that her home was their home. This petite invasion is underway throughout our area as the multicolored Asian lady beetle (a.k.a. the Halloween lady beetle) seeks winter refuge in homes, schools, and office buildings. 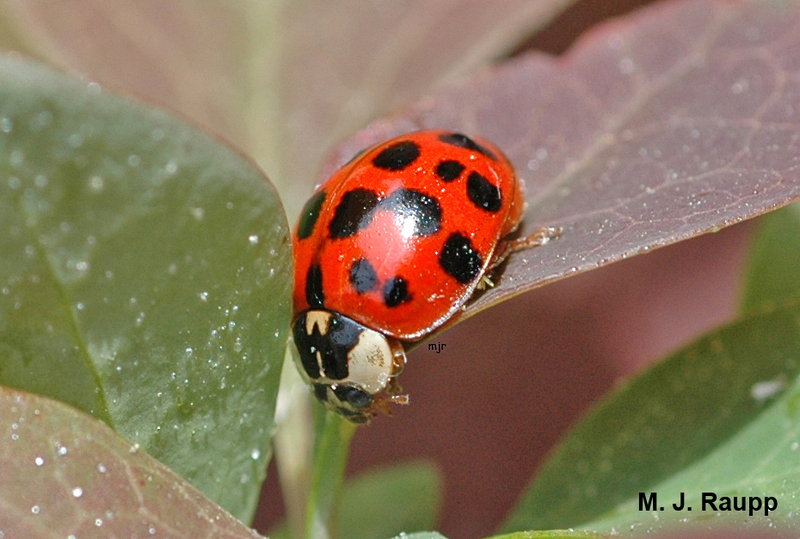 Harmonia axyridis is a prodigious killer of aphids and other nasty pests in our gardens. In one grove of barberries, I witnessed the annihilation of a booming aphid population. The dazzling lady beetle adults and their alligator-like spawn so completely attacked their prey that I could not find a single living aphid a couple of weeks after they discovered the aphid patch. Harmonia adults have been reported to consume more than 250 aphids each day, and the larvae may eat more than 1,200 during their development. In addition to eating large numbers of aphids, they devour other pests including adelgids, scales insects, and psyllids. Like many predators, they also eat each other. 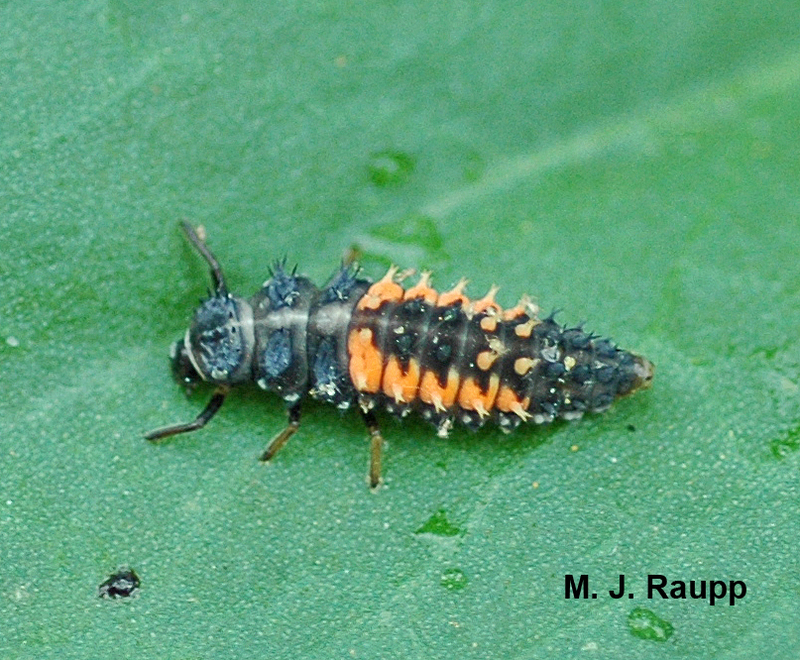 A single Harmonia larva may consume more than 1200 aphids during its development. As early as 1916, deliberate attempts were made to introduce Harmonia axyridis into the United States from their aboriginal home in Asia, to be used for biological control of certain pests in the U.S. We are not exactly sure how or when this lady beetle arrived, but by the mid-1980s, it was firmly entrenched in the southern United States. By 1993, it was reported in several Mid-Atlantic States, including Maryland. It is now distributed from Florida to Washington State. I have heard reports of people being “bitten” by ladybugs and confess that I, too, have gotten a small nip from Harmonia every now and then. A recent study discovered that these tiny awesome predators, in particular some smaller native species of lady beetles, do indeed bite humans and in some cases drink mammalian blood under laboratory conditions. Yikes! Before you duck and cover your jugular, take solace in the knowledge that Harmonia exhibited no tendency to drink blood. There is one caution you might heed as you deal with home-invading lady beetles. When handled or disturbed, they can release a smelly, bitter, secretion that may leave a faint yellow stain on your skin, wall, or curtain. This neat trick is called reflex bleeding and it is their way of delivering a nasty surprise to a would-be predator. Why the fascination with invading our homes? Are these ladybugs simply nosey or are we next on the menu now that the aphids are gone? As winter approaches, Harmonia seek protected locations such as crevices and cracks in rocky cliffs and outcroppings to escape the ravages of winter. Throughout the cities and suburbs of Washington and Baltimore rocky cliffs are scarce, but homes and buildings are plentiful. Like the brown marmorated stink bug we met several weeks ago, this is the time that Harmonia fly to our homes and attempt to find refuge. Any cracks around windows, breaks in stone foundations, unscreened vents in the attic, or gaps in facer boards can allow entry to your home. Once inside the beetles settle-in and become dormant for the winter, but on warm days in the late winter and early spring they may become active and find their way to sunny windows, where they attempt to escape. To prevent these and other invaders from entering your home, repair screens on your windows and vents, caulk your foundation, seal air conditioners, and eliminate points of entry to your home. Not only will this keep invaders out, but it will also help keep warm air in and reduce your heating costs. If you find the beetles a problem indoors, carefully sweep or vacuum them up and release them in a protected spot outdoors such as a tool shed. One of the real delights of the season is to visit nearby summits such as the rocky crags of Old Rag Mountain in Virginia or Sugarloaf Mountain in Maryland to witness thousands of multicolored Asian ladybeetles gathering on the sunny cliffs for one last bask in the sun before turning in for the winter. You better hurry. The arrival of the multicolored Asian lady beetle is a sure sign that Old Man Winter is just around the corner. Whether it's behind a green shutter or under loose window trim, Asian lady beetles are in a hurry to find winter refuge. Bug of the Week thanks Erin and Eloise who provided the inspiration for this episode. 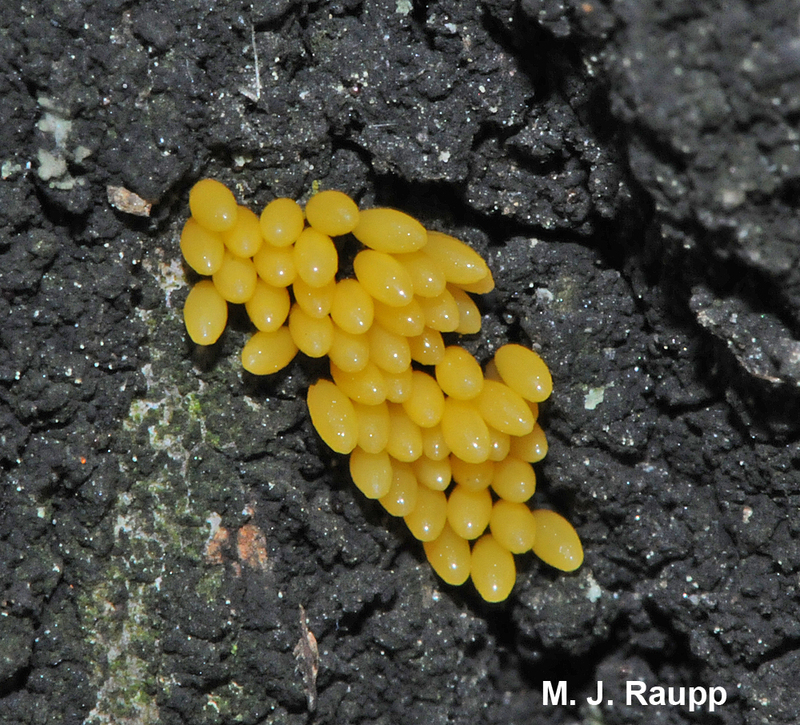 The interesting study by Sam Ramsey and John Losey entitled “Why is Harmonia axyridis the culprit in coccinellid biting incidents? “ was consulted to prepare this article.